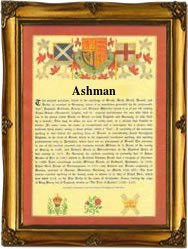 This interesting surname, of Anglo-Saxon origin, and recorded as Ashman, Asman and Ashment, is derived from the Middle English personal name "Asheman", from the Olde English pre 7th Century "Aeschmann", recorded as "Assemanus" in the Domesday Book of 1086. It was probably a byname form of "qescman" meaning "seaman" or "pirate", a compound of the Olde English "aesc" (boat made of) ash, plus "mann", man. It can also be a topographical name for someone who lived near a prominent ash tree. The surname dates back to the late 13th Century (see below), and further recordings include one Robert Asheman (1275), in the Hundred Rolls of Suffolk, and Roger Asman (1279) in the Hundred Rolls of Cambridgeshire. Nicholas Ashman (1299) was the bailiff of Yarmouth, Norfolk, in the reign of King Edward 1 (1272 - 1307). Variations in the idiom of the spelling include Ashment, Asman, Aisman, Ascheman, and Asscheman. Recordings from London Church Registers include: the christening of Elizabeth, daughter of Thomas and Alice Ashman, at St. Bride's, Fleet Street, on August 24th 1620, and the christening of Thomas, son of John Ashman, on August 25th 1641, at St. Olave's, Southwark. A Coat of Arms granted to the Ashman family is a gold shield with three silver fleurs-de-lis on a red bend between two black talbots' heads, the Crest being a hautboy in pale. The first recorded spelling of the family name is shown to be that of William Asseman, which was dated 1273, in the "Subsidy Rolls of Suffolk", during the reign of King Edward 1, known as "The Hammer of the Scots", 1272 - 1307. Surnames became necessary when governments introduced personal taxation. In England this was known as Poll Tax. Throughout the centuries, surnames in every country have continued to "develop" often leading to astonishing variants of the original spelling.